The US and EU economic sanctions on Syria are inflicting suffering upon ordinary Syrians and preventing the delivery of humanitarian aid, according to a leaked UN internal report. Embargoes supposed to target President Bashar al-Assad to contribute to his removal from power instead are creating difficulties for transit of foodstuffs, fuel and healthcare to the populace. The Intercept quotes an internal UN e-mail by a senior official saying sanctions have been a “principal factor” degrading the Syrian health system; they’ve contributed to price rises of 300% for wheat flour and 650% for rice following a doubling of fuel prices in the last 18 months. Syria was once largely self-sufficient in pharmaceuticals but many production plants in the Aleppo area have been destroyed or rendered unusable by conflict. The e-mail indicates many surviving plants have been forced to close due to sanctions on obtaining raw materials from abroad (and the foreign currency to pay for them). The UN report’s author describes conflict in Syria as the greatest humanitarian crisis the world has seen since 1945; 13 million people, or two-thirds of the population, in need of assistance. The disaster has prompted exodus of at least five million refugees and displacement of four million people internally. It goes further to say chaos has weakened the state and certain conditions have fostered the growth of ISIS. Sanctions are catalyzing humanitarian calamity while Mr. Assad remains firmly in power. In many respects the situation resembles Iraq’s (between 1990 and 2003): UN sanctions lead to social dissolution and destroyed that economy without reducing the power of Saddam Hussein as Iraqi leader. Many critics of Iraqi sanctions argue that mass impoverishment contributed significantly to political and sectarian breakdown after the invasion of 2003. The report asserts the same process is now taking place in Syria. 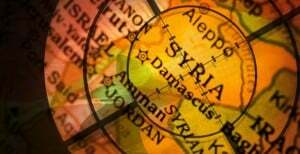 “In totality, the US and EU sanctions in Syria are some of the most complicated and far-reaching sanctions regimes ever imposed.” Synchronous with the humanitarian crisis is a complex network of non-UN sanctions targeting the government and entities and individuals alleged to have contributed to violence and human rights abuses. The EU has imposed wide-ranging prohibitions on commercial and banking dealings with Syria and controlled export of “dual use” items potentially having some security application while US sanctions extend further– a blanket ban on financial dealings with and export of foreign goods (with US content exceeding ten percent of a finished item’s value) to Syria. Viable means of getting purely humanitarian goods into the country are sporadic if possible at all. According to a study conducted by BASMA Association for children with cancer, which provides free treatment to about 650 yearly, up to 50% in Syria are cured amid international concerns over the growth of this non-communicable disease– and an abundance of local challenges including drug shortage and price hikes. Rima Salem, Executive Director at BASMA Association, said the study used data for children between 2009 and 2013 based on fact that treatment for most common cancers requires at least 5 years to determine treatment benefits. She added that to mark International Childhood Cancer Day (February 15th annually) the association’s campaign this year will launch under the title “Smile has returned” and will include 28 ways to bring focus to pediatric cancer, provide support to children with cancer, and awareness-raising activities in public and private universities. Salem noted there has been a little improvement in medicine availability and is highly appreciative of efforts made by those attempting to bring smiles to the faces of children. Director of the University Children’s Hospital in Damascus Dr. Mazen al-Haddad said the hospital receives up to 7000 children with cancer every year, providing 97% of cancer medicines to patients for free– another high-pressure challenge related to temporary closure of al-Bairouni Hospital and transfer of all cancer patients to the Children’s Hospital. Sanctions meant to negatively impact the democratically elected president of Syria have proven detrimental to civilians, especially when it comes to health and medical needs. What the US and EU have effectively done with their harsh sanctions is make life increasingly difficult for the most vulnerable and innocent members of society. The Syrian government is doing whatever it can to counter these obstacles providing medicine and medical care to the best of it’s ability. If the US and EU actually cared about civilians, placing human need before strictly-focused agendas, they would ease sanctions directly affecting the majority of civilians. Evidence to the contrary is blatant: their humanitarian guise is nothing more than excuse to force “regime change” in a war- torn country.